We all know the mantra about the listening room being 'the most important component in the hi-fi chain', but in practice, it's not always so easy to fix it. One frequent room-related problem can be dealt with, though, and that's things that go bump, rattle and resonate, during the night. A typical room has plenty of hidden sources of unwanted noise that can be excited by the sound coming from the loudspeakers and add their own little colour in the background, reducing the precision with which you, the listener, can hear what you want to hear – the music! The big problem is locating these various 'noises off'. Typically, they are either intermittent or even not directly audible, so you may not always be aware of them. In the Clean Sweep, Russ Andrews has produced a cunning way of finding them. 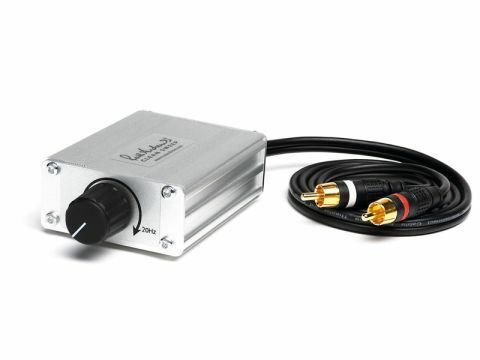 It's simply a tunable tone generator that can produce frequencies in the range of 20Hz (actually more like 8Hz in our review unit) to 200Hz. You plug it in next to an unused input on your amp, set the volume to something similar to loudish music and sweep slowly across the range. It's amazing how little buzzes and ratttles show up and once you've got them resonating steadily it's usually easy to find them and then fix them with Blu-Tack, a judicious screw or nail, or simply repositioning. When you've done that you can set the Clean Sweep to a low frequency and use it to burn in your speakers, another worthwhile activity. Well worth the money and the time you'll spend.